1. We have the largest stock of Wickmans in North America. This means short lead times, as quick as a few days! 2. We turn-key jobs at competitive prices, working hand and hand with trusted tooling providers. 3. We speak proper English (American). We also speak Spanish, Italian, Irish, and Pig Latin. 4. We provide prompt Phone and In-person Customer Service. 5. Our three mechanics have over 80 years combined experience working on Wickmans. Graff-Pinkert held a seminar at its facility in which we showcased a solution to the age old problem of long stringy chips that clog up screw machines when working with materials such as aluminum and copper. 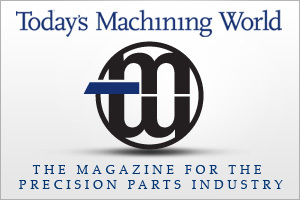 Graff-Pinkert's salesman Rex Magagnotti suggested that Logan Clutch could program an automated high/low clutch for a Wickman multi-spindle that would automatically execute intermittent cuts to break the chips. It was an adaptation of an old school approach of notching a cam that could peck drill to break chips. Logan Clutch's engineers successfully accomplished this feat and presented the product on a Wickman 1-3/4" at Graff-Pinkert's Screw Machine Innovations Seminar. Graff-Pinkert just got in two Hydromats, an HB45-12 bar machine, HB45-12 Chucker, and an HW25-12 bar machine! We offer hydromats with saw, bar feed and inverter, and then customers can choose from our wide selection of units to get the right configuration for their specific jobs. Why buy units you don't need, just because a machine happened to have those units? Because Graff-Pinkert is one of the few Hydromat resellers that actually stocks Hydromats at our facility, we have the flexibility to sell you a cleaned and painted machine that will arrive on your floor ready to run. The following videos give step by step instructions for changing the pins and bushings of the upper quadrants of a Wickman 1-3/4" 6-spindle. 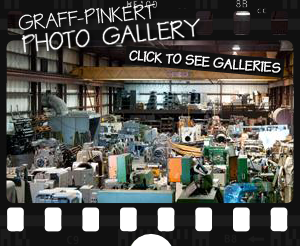 The videos were shot at Graff-Pinkert's facility. Click "read more" to see the second and third videos. Part 1: Changing Pins and Bushings on Upper Quadrants of Wickman 1-3/4"
Part 2: Changing Pins and Bushings on Upper Quadrants of Wickman 1-3/4"
Part 3: Changing Pins and Bushings on Upper Quadrants of Wickman 1-3/4"
This video is a step by step instruction on changing spindle bearings on an Acme-Gridley screw machine. The demonstrator is is Don Anger, considered one of the top Acme service people in the world. Yesterday was an emotional day for me. I gave out end of the year bonus checks to the employees of my used machinery company, Graff-Pinkert, holding impromptu talks with each person after delivering each envelope. I thanked each person for their contribution, asked them how they could improve next year and how I could help them. Paternalistic, very old school.I found myself holding back my tears during some of the sessions. I scurried to an empty shop office to pull myself together — and wept. Some context. As I drove to work yesterday, I was wallowing in a sense of futility. Which Multi-Spindle Is Right For You? Read more about Which Multi-Spindle Is Right For You? Graff-Pinkert & Co. is a family-owned, 70-year-old firm dedicated to selling great machine tools to the turned parts industry. We are an international leader in used automatic screw machines (multi-spindles), CNC Swiss, and Hydromat rotary transfer machines (Pfiffner machines). Our stock of multispindle screw machines includes, Wickman (Wickman-Group), Acme-Gridley (National ACME), Euroturn (ZPS, Mori-Say), Schutte, INDEX MS, Gildemeister, New Britain, Tornos, and Davenport. We also cell CNC Swiss Lathes, including Star, Citizen, Tornos DECO, and Tsugami. We sell CNC lathes, including INDEX ABC, Mori-seiki, Haas, and Okuma. Recently we have begun selling Durr Ecoclean parts washers, models 80c and 81c.